Outside The Gate is released on the heels of the single America on 15 May 1988. 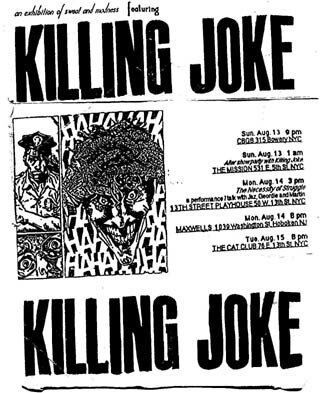 The album was reportedly intended to be a Coleman solo album, but the band's label, EG Records, distributed it as a Killing Joke album in an effort to boost sales. However, the album proves to be a critical and commercial disappointment. Little effort is made to support the LP with live performances. Much of the year is instead spent sorting out legal matters to sever the band's ties to EG; they were free to find a new label, but EG retained publishing rights for an additional number of years, in an effort to recover costs of recording Outside The Gate. The situation is understandably stressful, leading Jaz to suffer a nervous breakdown. Toward the end of the year, Jaz and Geordie elect to pick up the pieces and move on, first seeking out a new rhythm section. A new drummer is secured in the form of ex-PiL member Martin Atkins. A replacement bassist proves to be slightly more problematic. Andy Rourke (ex-The Smiths) is first brought into the fold but leaves after only three days. Taif Ball follows and is part of the line-up touring the UK and the USA. It is generally agreed that the new material written and recorded during this period - most of which eventually appeared on 1990's Extremities, Dirt And Various Repressed Emotions - represents a phoenix-like rebirth for Killing Joke. 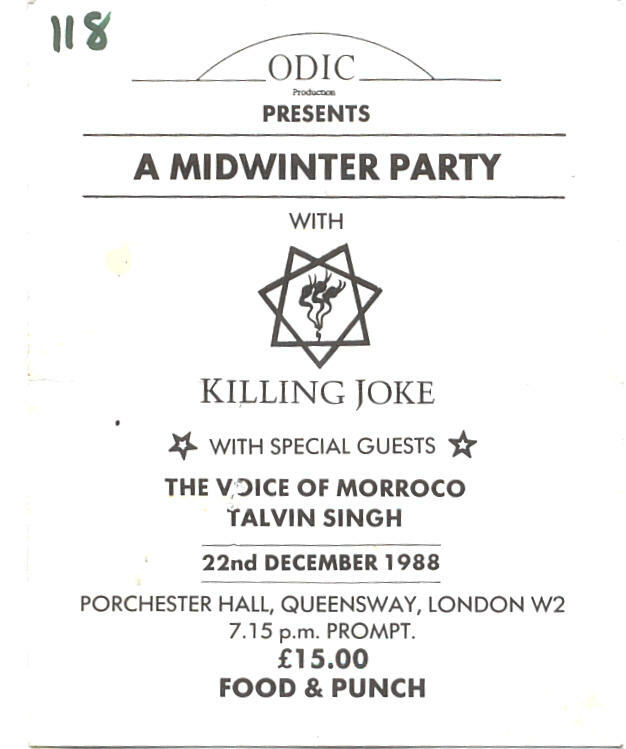 This gig was preceded by a launch party for the band's ODIC network. In addition to the evening's entertainment, a flexi-disc recording of The Beautiful Dead was offered; this was unique in that the recording was a demo with only Jaz and Geordie playing on it. Setlist: Extremities/ The Fanatic/ Song and Dance/ Intravenous/ Wardance/ The Beautiful Dead/ Change/ Frenzy/ Kings & Queens/ Requiem/ Night Time/ The Wait/ Eighties/ The Pandys Are Coming/ Love Like Blood/ Extremities (yes, again). Watch a portion of the concert. "Well, what would YOU expect at a Jaz Coleman party? Angel cakes and Pass The Parcel, or fruitcakes playing Russian Roulette? Forever fine exponents of unorthodox behaviour, the first Killing Joke appearance in London for two years is a one-off, a unique performance where expecting the unexpected is akin to space-hopping through a minefield of anticipation. Would the 'free punch' be a fist in the face or a sickening combination of alcoholic beverages? Portchester Hall is equipped with Turkish Baths, library and shimmering chandeliers. A banquet of exotic Middle Eastern food is promised (rumoured to have been concocted by Iran Air) and that's why it costs £15 to get in. Unless you've joined the fan club, which costs £20. The '7.15 prompt' starting time is rendered ridiculous by a fraught soundcheck, but when the fans creep in one-and-a-half hours late, the Jokers live up to their invites and go down to the doors. If you can't imagine Jaz Coleman as a socialite then you haven't seen him in a three-piece suit, welcoming the 'guests' to the strains of a violinist. Judging by the superbly relaxed atmosphere, such diplomacy pays off. Musical performances by Mohammed Kamouch And The Voice Of Morocco and Indian traditionalist Calvin Singh receive polite applause from the beseated banquetters (no small thanks to Jaz's personal introductions), and the only problem thus far encountered is the woeful ratio between crumbs of pita bread and mountains of taramasalata. But it is an apt imbalance, for aren't our hosts inclined to send out signals of instability? Certainly, on the minute stage, the glacial Geordie is effortlessly aloof next to the tortured, crippled Coleman as the latter leads their chundering charge. There's the sickly distorted guitar, twisted synths, bellowing billowing vocals . . . they've only got one song but they'll play it in hell. With this salivating ceremony, the mad mass are a religion unto themselves - yet tonight Jaz isn't the persecuted preacher. Sure, it's hysterical in a wild-eyed and headless sort of way, but Jaz is enjoying his anguish. Good grief, even his smiles look natural! And there are treats for the faithful, including the first airing of 'Song And Dance' for five years. Setlist: Follow The Leaders/ Extremities/ The Fanatic/ Wardance/ Song & Dance/ Intravenous/ The Beautiful Dead/ Change/ Frenzy/ Requiem/ Night Time/ Age Of Greed/ The Wait/ Eighties. Encores: Psyche, Love Like Blood, Kings & Queens. Taif recalls that this was his most memorable gig with the band: "One of the the great gigs of all time, I had an out of body experience, Jaz had his talisman for various reasons, it was much more than insane, all the forces came together. We even played Love Like Blood!" "Greeted by appreciative applause following a new Killing Joke song - high on energy and as one-dimensional as ever - Jaz Coleman stutters one of his party-pooping one-liners. "I don't understand your compassion! All I see is war ... war ... WARDANCE"! In time-honoured fashion, the old Jokers' Battle Hymn sends the battalions all hot and sweaty. Whatever spell was cast by Coleman - who tonight had reverted back to close crop and war-paint - way back when, it must have involved some potent brews. A packed Kilburn National - KJ's first British gig for close on four years - is testament to something, at least. From the unspeakable power of the opening 'Fall Of Because' to approximately halfway through, the sound is dire. What merits the handful of new songs played have are lost in a horrible bass distortion; many seem little more than vehicles for Coleman's increasingly convoluted rants. The one face-saving constant is the barbaric beauty of Geordie's guitar. Drummer Martin Atkins and bassist Taif did their jobs adequately, but it was still the past glories that conquered. With a delirious 'Change' the sound cleared, to be followed by 'Requiem', 'The Wait' and 'Eighties'. Setlist: The Fall Of Because/ Extremities/ The Fanatic/ Wardance/ Song & Dance/ Intravenous/ The Beautiful Dead/ Change/ Frenzy/ Requiem/ Night Time/ Money Is Not Our God/ The Wait/ Eighties/ Kings And Queens. Jaz, Geordie and Martin Atkins also held a lecture/Q&A session called "The Necessity of Struggle" at the 13th Street Playhouse in New York on 14 August before the gig. Another hiatus as Jaz departs for Egypt to collaborate with composer/Art Of Noise member Anne Dudley on Songs From The Victorious City, a well-received blend of Western and Arabic classical music. In August, Killing Joke re-group, this time with Paul Raven rejoining the band, to record the Extremities album. This appearance coincides with the release of the Extremities album. At some point during this time, the band filmed the video for Money Is Not Our God in Chicago (which could explain why they played it twice!). Setlist: Money Is Not Our God/ Extremities/ Wardance/ Intravenous/ The Beautiful Dead/ Change/ Frenzy/ Struggle/ Requiem/ Age Of Greed/ Night Time/ The Wait/ Love Like Blood/ Money Is Not Our God. John Bechdel joins the tour on keyboards. Setlist: Inside The Termite Mound/ Money Is Not Our God/ Extremities/ Wardance/ Intravenous/ The Beautiful Dead/ Change/ A New Day/ Age Of Greed/ Requiem/ Complications/ The Wait/ Love Like Blood/ Pssyche. Setlist: Inside The Termite Mound/Money Is Not Our God/Extremities/Wardance/We Have Joy/Intravenous/The Beautiful Dead/Change/Frenzy/Age Of Greed/Requiem/Complications/The Wait/Empire Song/Psyche. Setlist: Inside The Termite Mound/Money Is Not Our God/Extremities/Wardance/Intravenous/The Beautiful Dead/Frenzy/Age Of Greed/Requiem/Complications/The Wait/Psyche. A break ensues here as Raven and Martin Atkins tour the USA with the side project Pigface. Setlist: Inside The Termite Mound/ Money Is Not Our God/ Extremities/ Complications/ Intravenous/ The Beautiful Dead/ Change/ Frenzy/ Age Of Greed/ Kings And Queens/ Requiem/The Wait/ We Have Joy/ Wardance/ Psyche. The re-start that seemed promising from the Extremities album and tour sputtered at this point. Reports circulate that the band have acrimoniously split (again), this time for good (again). Jaz emigrates to New Zealand and resumes his classical music career, leaving Geordie to form Murder Inc. with Raven and Martin Atkins, with Chris Connelly providing vocals. Geordie recalls: "Aktins said, 'I've got some money. Let's record an album.' Formed the band, wrote the music, recorded and mixed it, finished it within three weeks. But then it didn't come out 'til a year later and some of the members did the Pigface thing and it turned ugly and a lot of them fell out with each other. And that was that." A handful of live performances are organised in 1992, but most are eventually cancelled. No further band activity would be seen for nearly two years except for the release of the best-of album Laugh? I Nearly Bought One! Geordie again: "I got involved in that to make sure the right tracks were on it. I rang Youth to see if he had any old photos for the art work. And he was just like, 'Oh, we should reform then.' I thought he was joking. He said it one day, just the way he said it. And within about a month, he put an offer in and off we went." Jaz: "Whatever happens, whatever we've done there will always be the dream that we had as seventeen year olds, the vision, the idea. It's something that will always bind us. We all know it."